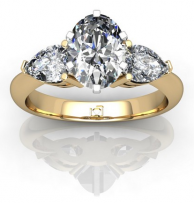 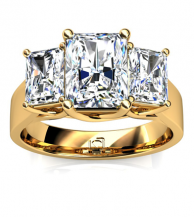 This is a glamorous, unique engagement ring that will easily stand out among the rest. 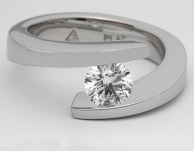 First, the tension setting provides a breath taking view for your center diamond. 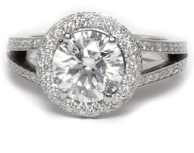 Next, pave diamonds decorate the rounded 14k white gold band and add additional sparkle. 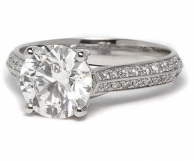 You can choose a round or oval shaped diamond to set in this ring. 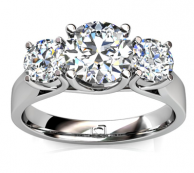 Breathtaking, spiraling tension set engagement ring in platinum that holds your center diamond with a flair. 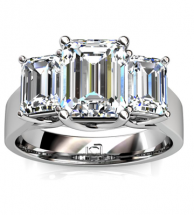 A unique, modern setting that will stand out from the rest. 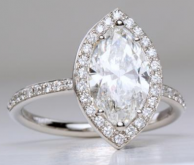 Shown here with a round diamond but can also be set with a pear, oval, princess, or emerald shaped diamond.